In the second of the four-part series on how ready India is for the September 25 launch of Ayushman Bharat, Veena Mani and Karan Choudhury reveal the shocking state of affair in Panipat, Haryana. Satish Kumar, a plumber and part-time farmer in Panipat, Haryana, had been feeling a niggling pain in his chest for days. His neighbourhood doctor said that he could be suffering from a blocked artery and that he might need a stent implant. The doctor advised Kumar to go to the Civil Hospital and get registered under the Ayushman Bharat scheme so his surgery would be free. The city’s main government hospital is one of the many chosen for a pilot of Prime Minister Narendra Modi’s grand universal healthcare scheme which is set to roll out on September 25. However, when he went to the hospital, Kumar was in for a shock. The Ayushman ‘Mitra’ (friend) manning the Ayushman Bharat counter tucked away in the old wing of the hospital, was helpful alright. But when he logged into the scheme’s website, what popped up was a blank home screen with the legend, “The website is under maintenance”. Undeterred, the 20-something ‘Mitra’ managed to open the website on his phone. He punched in Kumar’s full name, as he had been trained to do, but the name did not show up on the list of beneficiaries. Then he tried with Kumar’s ration card number and finally, his father’s name. But the result was the same every time. Finally, the ‘Mitra’ was forced to tell Kumar that since his name was not on the list, he could not get registered for Ayushman Bharat. The ‘Mitra’ told Business Standard that in the two days that he had been on the job, not one of those who came to get registered for the scheme was to be found on the list of beneficiaries. Once it is operational, Ayushman Bharat will provide a medical cover of Rs 500,000 per family per year. About 10 crore families are set to benefit from the scheme. However, in Panipat at least, the ambitious programme seems to be on shaky grounds right now. From coming up with the correct list of beneficiaries to finding enough people to work as Ayushman Mitras to generating awareness about the scheme -- many things need to fall in place before it can be successfully launched in a few days. From finding people ready to work as Ayushman Mitra, awareness about the scheme, to most importantly being part of the list of beneficiaries, a lot needs to fall in place for Panipat to successfully launch the flagship scheme. The Ayushman Bharat scheme aims at providing insurance cover to poor families upto Rs 500,000. They are identifying the beneficiaries based on SECC data. Every hospital empanelled with the government, for the scheme will have Ayushman Mitras at the helpdesk. For hospitals that have upto 10 cases, one Ayushman Mitra will be deployed. For hospitals where cases are between 10 and 20, 2 people will be at the helpdesk. This will be three where cases are more than 20 but less than 30. There will be four of them where cases are more than that. The biggest hitch could be the beneficiary list, which is supposed to be based on the Socio Economic and Caste Census (SECC), 2011. However, it seems that not every eligible person has made it to the list. The ‘Mitras’ say they are powerless to do anything if a person’s name is not on the list. Incidentally, Haryana has over 4,630,959 listed households out of which Panipat accounts for 75,000 households. There is a lack of awareness about the scheme as well. “We are trying to reach out to people through banners in our hospital and nearby areas. We are also telling village heads about the scheme,” said Naveen Kumar Suneja, acting civil surgeon at the hospital. Crucially, the Common Service Centres (CSCs), which are supposed to educate people in rural areas about government schemes, have next to no information about Ayushman Bharat as yet. “We mostly get information about schemes in an email or on the WhatsApp group which we are part of. But so far we haven’t got much information about this one,” said Vijay Pal Gahlyan, who runs a CSC in Jhattipur village in Panipat. The sarpanch of the village Ashok Kumar said, however, that he had received some pamphlets about Ayushman Bharat. “We are making people aware of the scheme,” he said. 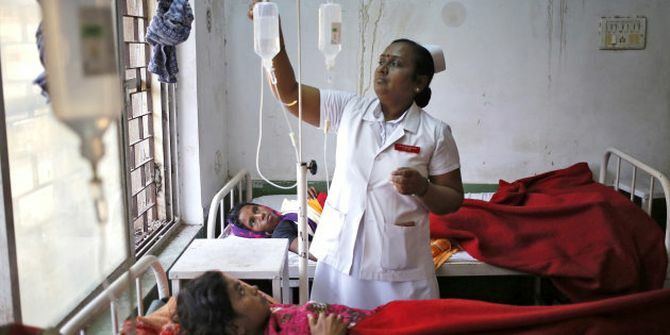 The other roadblocks to a speedy rollout of Ayushman Bharat could be the lack of manpower and technical preparedness. Suneja claims that computers are in place and functions such as the up-linking of patient information or payments via direct benefit transfer will all happen smoothly. But though software giant Tata Consultancy Services is handling the backend of the operations, many are unsure as to how technical glitches will be resolved. “All we know is that the website has the number of a person assigned to this hospital whom we are supposed to call if there is a technical problem,” said one ‘Mitra’. The recruitment of Ayushman Mitras has also become problematic with many claiming that though the job advertisement promised them a salary of Rs 15,000, they were getting only Rs 5,000. Putting in place adequate infrastructure in hospitals is crucial for the success of the scheme. The civil hospital in Panipat is upgrading itself to a 300-bedded hospital from the existing 100-beds. This is likely to take at least a year. It is grappling with technical manpower to conduct tests even now. The number of lab technicians are working at half the strength. Tests results that were earlier supposed to reach the patient on the same day will now reach the next day as more and more patients are getting tests done and the laboratory department does not have enough staff. Not just major hospital chains are sceptical to enroll for the Ayushman Bharat scheme. But this feeling is also among the smaller private player. For them, the pinch point is the rates the government has set. Doctors at the Prem Hospital in Panipat say that even for them the rates capped by the government aren’t viable. The state government has not also done much to interact with these hospitals and get them on board. All government hospitals are part of the scheme. Doctors at the civil hospital in Panipat say that if a CGHS beneficiary and an Ayushman Bharat beneficiary, for the same procedure, the one with the registration first will get the preference. If a hospital does not have a particular facility the patient will referred to another district hospital, in this case the Kalpana Chawla Medical College in Karnal. The government in Haryana is also working on a parallel scheme. The government plans this scheme for those below the poverty line. According to sources, for the second scheme, people will have to pay for the premium but the premium will be a small amount. These people aware of the development say that the government is thinking on a second scheme because many poor people are being left out of Ayushman Bharat. In addition to that the government will not be able to pay the premium for all patients. Image used for representational purpose. Photograph: Anindito Mukherjee/Reuters. Will Ayushman Bharat disrupt the health insurance market?